The Sims 3 is a great game for making a nice little family in a house with a white picket fence, a dog, and 2.5 children. However, that gets old after a while (and there are only so many ways torture and kill off your sims before that becomes boring). 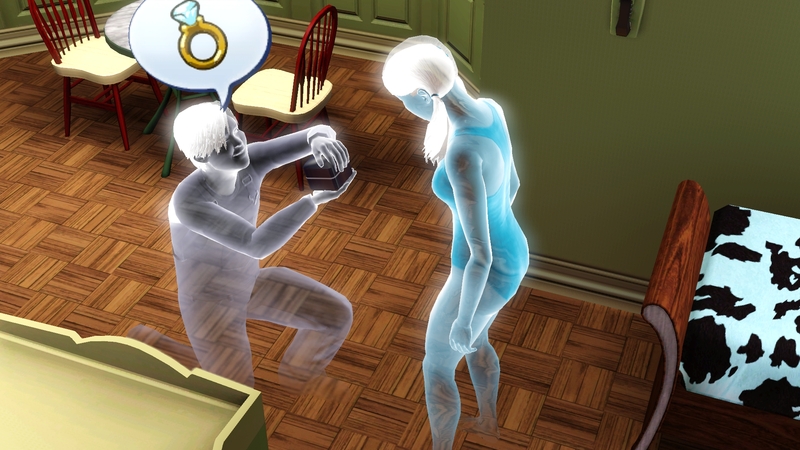 What a lot of people don’t seem to know is that the Sims is great for ghost families! 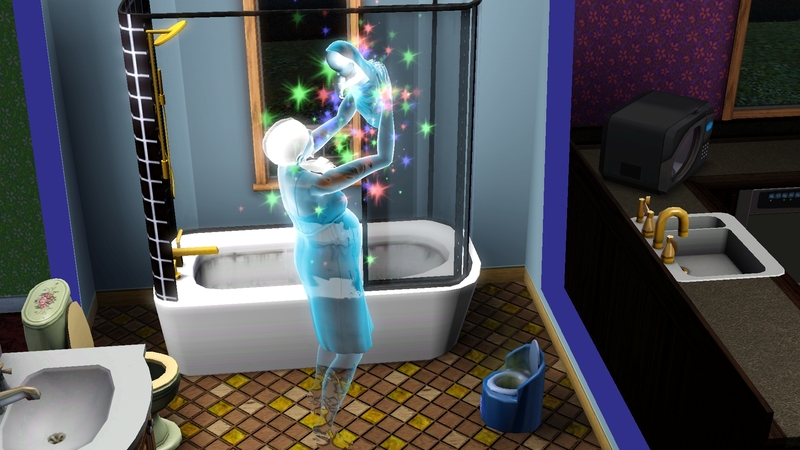 Ghost Sims can walk (float, really) right through walls, they can scare other sims, and they appear in translucent, shiny colors (oooh!). So you want your own sim ghost family, right? First, you need to find a ghost. Ghosts come out of gravestones at night, and you can interact with the ghosts for only a short window of time at night. So, you need a gravestone! You can attain a gravestone in one of two ways: have a sim with the “kleptomaniac” trait steal a gravestone from a graveyard, or have a family member die, producing a gravestone. When stealing a gravestone, it is important to note the little symbol seen on the grave – it is a symbol of how the sim died, and what color the ghost will be. Orange: Death from fire. Ghost has a fiery texture on it. Tombstone has a fire symbol. Pink / Purple: Death from starvation. Ghost has a cloudy, normal looking texture. Tombstone has a fork and a knife. Yellow: Death from electricity. Ghost appears to have electrical currents running through them. Tombstone has a lightning bolt. Blue: Death from drowning. Ghost has a watery texture on it. Tombstone has water droplet. White / Gray: Death from old age. Ghosts have a cloudy, normal looking texture. Tombstone has an hourglass. Break a T.V. You may need multiple T.V.’s, in case your sim repairs one successfully. Have your sim stand in front of the T.V. until he/she pisses himself. (Or break a dishwasher so it floods). Have your sim repair the T.V. while standing in their piss puddle. The water puddle & repairing T.V. combination gives an extremely high chance of electrocution. Now you have a ghost to work with! Now you need a female, human sim to befriend the ghost and woohoo for a baby. This may take a little bit, as the ghost is only available for a few hours during the night, and may vanish at the worst of times. Getting ready to make ghost sims…. 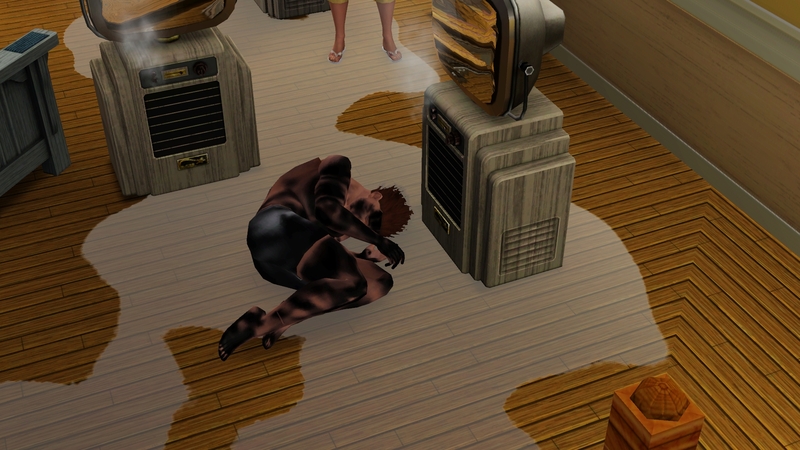 Things to keep in mind: Regular sim + Ghost sim has a 50% chance of a ghost baby, 50% chance of a normal baby. Ghost sim + Ghost sim has 100% chance of a ghost baby, with a 50% chance of having the color of a parent particular parent. But pretty soon you will have yourself a baby ghost, and then it’s only a matter of time before you collect some of each color! The one bad thing I did notice about my ghost sims, is that even though a sim is a ghost themselves, they will still get the “Spooked! Saw a ghost!” negative mood debuff when seeing another ghost. In this case, it happens when seeing other members of the family! And lastly, don’t forget to expand your family with ghost pets! So that’s how to make your very own ghost family! What out of the norm things have you been up to on the sims lately? i love sims but i could never figure out how to make aliens or ghosts. this is great!